What are these things? 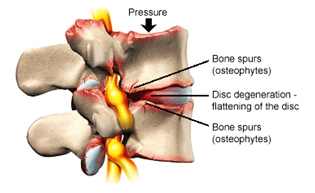 Spinal stenosis, degenerative joint disease, spinal arthritis? 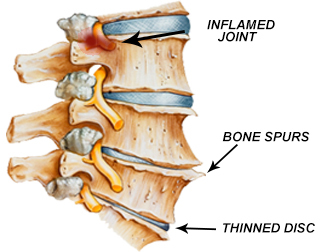 Degenerative joint means just how it sounds: The joint is breaking down. However, not all of the joint is breaking down. Let’s simplify what a joint is made of. 1) Some hard stuff 2) Some soft stuff. Hard stuff is like bone; soft stuff is like cartilage. In arthritis, the soft stuff breaks down, but, the hard usually stays the same or builds up. The cartilage goes away; the bone often gets more of itself. 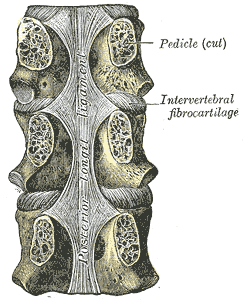 We can see the spine is made up of bone, the vertebrae, and cartilage, the intervertebral discs. 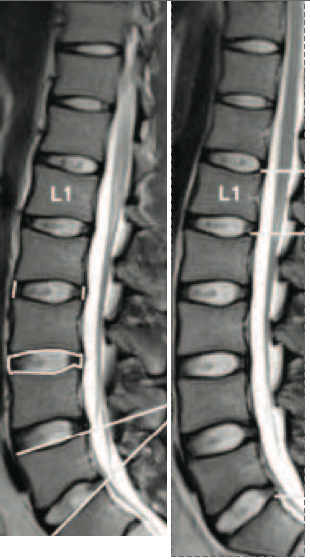 Going back to our description of what happens in arthritis: The intervertebral discs decrease in size; the vertebrae stay the same / increase in size. One of the longstanding beliefs as to why this is happens is bone has a very good blood supply while cartilage does not. Therefore, the cartilage is more likely to breakdown. Without a good blood supply, it’s hard for it to rebuild itself. Next, as the cartilage breaks down, the bones -vertebrae- come closer and closer to one another. Eventually, they touch one another, to the point they’re basically banging each other. This can cause them to grow. Think of it like lifting weights -the more pressure you put on your muscles, the more they tend to grow. Well, the more pressure you put on your bones, the more they tend to grow. The difference here is our own bones are putting pressure on themselves. In the middle of each vertebra is a hole for the spinal cord to travel through. If the bones start to hypertrophy around the spinal cord, they’ll narrow this hole the cord is traveling through. 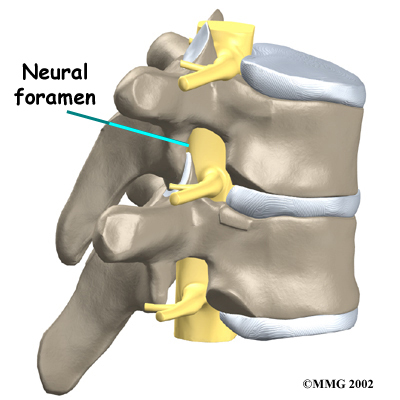 Just outside the vertebrae is another area where nerves travel through, called the foramina. If the bones start to rub against each other in this area -due to something like the discs degenerating- they’ll be lessening the space these nerves have to travel through. Just as above, the bones may make matters worse by hypertrophying around this area too. We call this spinal stenosis -the lessening of space around the nerves. 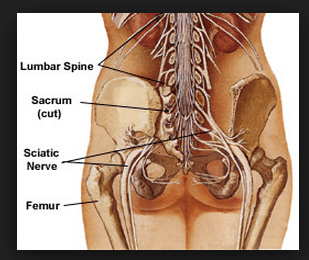 This often happens around the lower back, where the sciatic nerve starts. 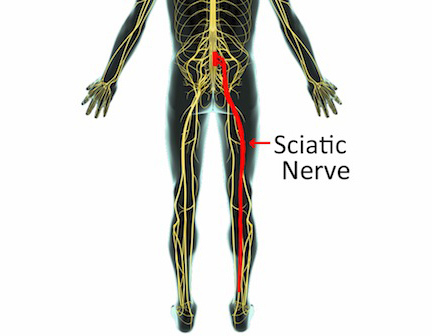 The sciatic nerve travels all the way down to the foot. Hence, that tingling / numbness you get running down your leg. Note: This is not the only possibility for having sciatic issues, but sciatic issues commonly accompany lumbar stenosis. Does this stuff even cause pain? In the last decade or so there has been a small movement towards disseminating the fact just because you have spinal arthritis, stenosis, or a beat up looking spine on an MRI, does not mean you’re in pain. One of the most often quoted studies is from the New England Journal of Medicine, where it was found a great deal of people with spine abnormalities aren’t in pain. 64% had an intervertebral disc abnormality, 7% had canal stenosis, 7% had foraminal stenosis; none of which were in pain. The main takeaway from this should be, “It’s not that spinal stenosis or degenerative disc disease cause pain, it’s that something else causes these issues, which can also cause pain.” That something else is how the person moves. Unfortunately, it seems this has been taken a different direction, to the tune of “It’s all in the brain!” A topic for another post. What I want to focus on here is the notion you can be in pain without having these ailments. At the same token, you can have these ailments and not be in pain. With that said, structure does matter. So, if there’s a plausible way to combat these ailments, why not use it? 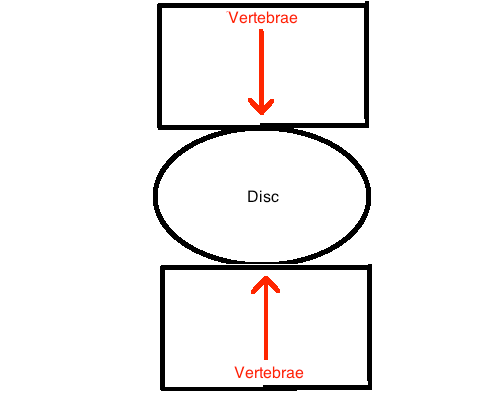 It’s important to note intervertebral discs don’t only get smaller; they can get bigger too. Think of the disc like a sponge ball. 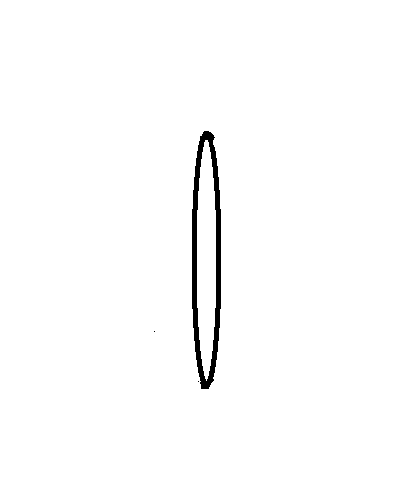 The way we often think of the disc is in compression. The sponge is getting the water squeezed out of it. Because none of us are going to space regularly, we’ll ignore this for the rest of the article. When we wake up in the morning we’re almost a half inch taller than at the end of the day. Why? Our discs gain a bit of size throughout the night. Thus, when waking, the discs are a little more full, and we’re a little bit taller. Over the course of the day, as we compress our spine, we get shorter. For many people, the compressive forces of the day outweigh the compressive forces of the night. Hence, as we get older, many people get shorter. Why do our discs do this? When the discs are vertically compressed they 1) Are having water squeezed out of them and 2) The compression causes there to be less room in the disc. Take away this compression, like when laying down, and suddenly the discs have some room to breathe, meaning water can now get back into the disc. (A form of osmosis. I linked a video at the end if interested.) 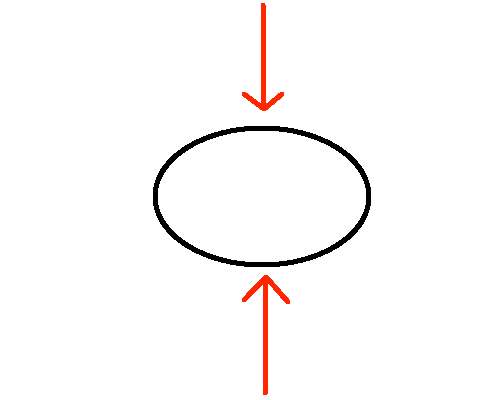 As I illustrated in the GIF above though, I think there is a compressive force still happening while horizontal, one we can take advantage of. More on that in a bit. Let’s look a bit more thoroughly at this study: Muscle Atrophy and Changes in Spinal Morphology. 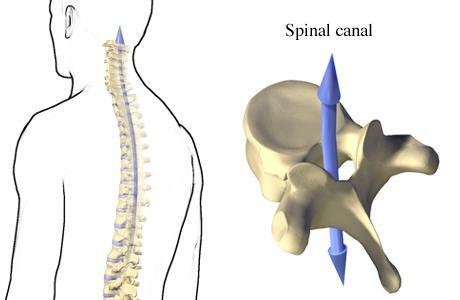 This study put people on bed rest for two months then examined what happened to their spines. Notice the last part of that quote. The area with the biggest increase in volume was the lumbar discs. The spinal area where people most suffer from degenerative issues. At first glance, the takeaway is obvious, lay down more often. I think it’s a bit more intricate than that though. It’s not just being horizontal, I believe how you lay down is important too. Let’s go back to our sponge analogy. In order to really get the liquid out of a sponge it needs to be compressed from two sides. When we’re upright, that’s easy to understand. 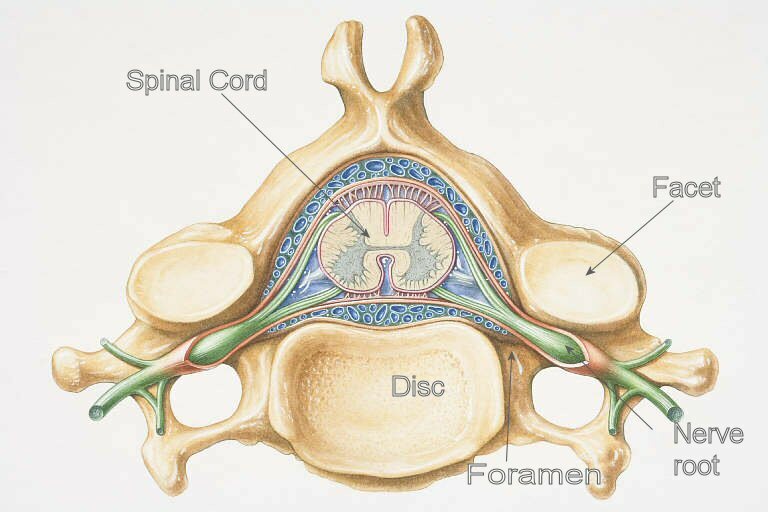 We have the vertebra on top and below of the disc. When horizontal we’re looking to get fluid back into the discs. Just by lying down we help the intervertebral discs get some breathing room. But, what if we could also help push our sponge ball back to its original shape? What’s on the other end though? 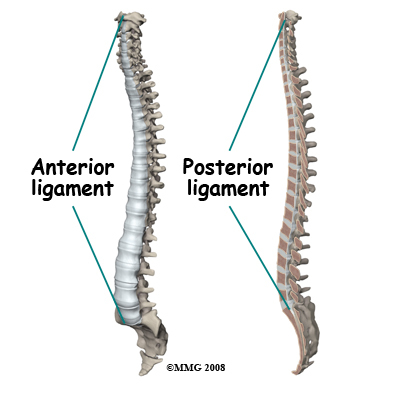 On the front and back of the spine, there is the anterior and posterior longitudinal ligaments. 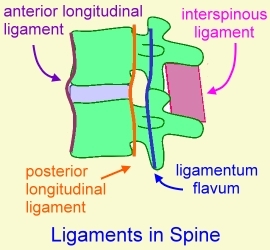 These ligaments help prevent the discs from going too far forward or backward. You can think of them as strong, taut nets. These would be analogous to the anterior and posterior cruciate ligaments of the knee, which prevent the knee from traveling too far forward or backward. There is a difference here though. At the sides of the knee, we also have the medial and lateral collateral ligaments. Same idea here. Anterior and posterior ligaments prevent excessive forward and back movement; medial and lateral ligaments prevent excessive side to side movement. 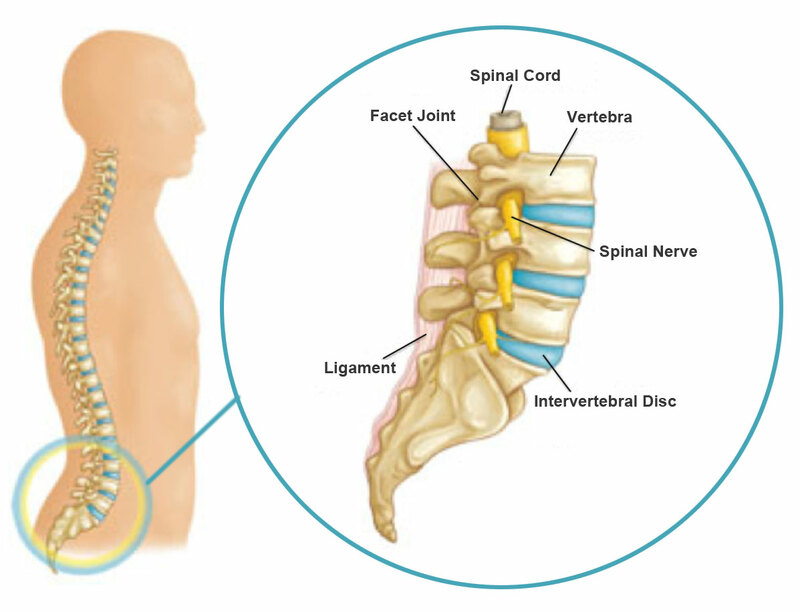 At the spine though, we don’t have any ligaments lateral to the discs. Let’s say you’re horizontal, but on your side. Our sponge is getting pushed down by gravity, but there’s nothing pushing or catching it from the opposite side. Our sponge is getting compressed from two ends. Exactly what it needs to help regain its lost size. There’s more to be said here than “Sleep on your back.” The idea is any instance where you can do what you’re doing laying on your back, it’s a good idea to entertain that option. Rather than watching TV on your side or in a chair, lay down on your back. Relaxing on your iPad? Do it on your back. That doesn’t mean do everything laying down. It’s not like bed rest for 60 days, which was done in that study, should be advised as a lower back treatment. Standing has a ton of benefits. I’m talking much more in instances where you want to take a load off, reconsider how you do it. Wouldn’t laying on our stomachs give the same advantages? Yes, however, considering everything else we do during the day, like siting at a desk for 8 hours, the types of shoes we wear, how we stand and what’s going on at the hips, sleeping on your stomach ends up being contraindicated. I give a more thorough explanation here: Correcting a swayback posture by…changing how you sleep? If you’re someone who knows your lower back stuff, perhaps you’ve read McGill’s book, you may have some further questions. 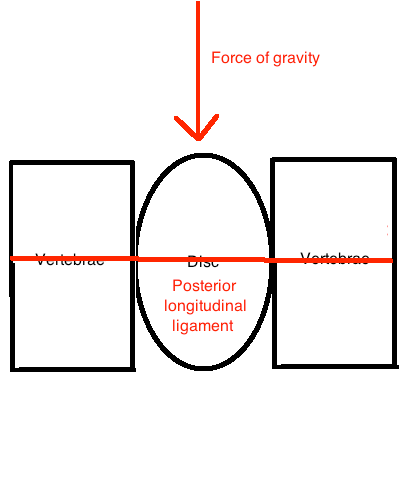 McGill talks about how the posterior longitudinal ligament often gets beat up. In other words, some people already flex their back too much, and laying on your back can put the lower back into flexion. If you’re someone who does this, you may be better off sleeping on your stomach, or, having some lower back support while on your back to give you a little lordosis. However, the majority of people have issues with extension, and see the swayback sleeping article above for info on other joints, specifically regarding the hip. 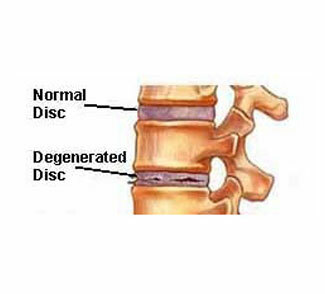 Are we actually going to reverse stenosis or degenerative discs? The biggest question in my mind here is, I fully believe this stuff can help us prevent / combat the effects of too much compression on our spine, however, once something like stenosis or a degenerative disc sets in, can we really reverse that process? I don’t know. I do know bone can atrophy, and, it often atrophies when we limit the stress put on it. So, maybe, by getting our discs some more fluid in them we lessen the stress on the bone, that in turn atrophies the bone a bit, perhaps lessening the constriction on the nerves. I’d love to see a thorough, well done study on something like this. And remember, just because you have these issues doesn’t mean you have to be in pain. One of my reasons for bringing all this up is I only ever see what happens to our discs when horizontal presented as a negative thing. McGill talks about too much bed rest being a possible pain provocation, I’ve seen many talk about how we should be really careful exercising our lower backs first thing in the morning, hell, the full title of that bed rest study is: Muscle Atrophy and Changes in Spinal Morphology: Is the Lumbar Spine Vulnerable After Prolonged Bed-Rest? The fact of the matter is most people don’t get enough bed rest (sleep) as it is, when their back is bothering them they prefer to lay down -usually on their back, and the first thing most people do after they wake up isn’t work out. (By the time one brushes their teeth, gets dressed, drives to the gym, whatever, there is little to worry about.) The issue is basically never a person has too much fluid in their discs. It’s almost always we wish there was more in there. Rather than be concerned what happens during the night, I think we should embrace it. Hopefully now you can see how to use this to your advantage. where can I learn more about reversing spinal stenosis or keeping it at bay? You can check out my recommended learning page, specifically the movement / exercise / pain categories. Hey mang, good info! Thanks for the write up. 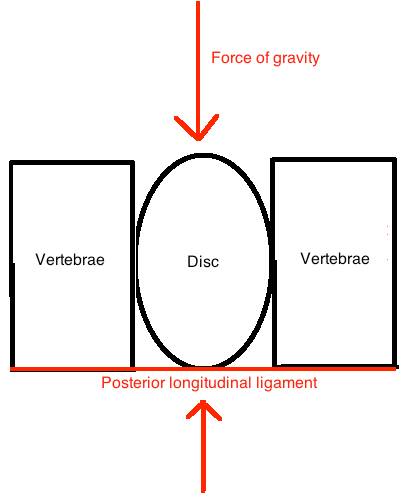 I was wondering about hanging upside down and how it might speed up the decompression of discs but since you don`t mention it I was thinking that you either have not looked into it or didn`t think worth mentioning since it doesn`t do much good or perhaps more bad? Your thoughts? Also, their is a device called the posture pump disc hydrator, do you think this can speed up the hydration process? It seems that it makes sense to take stress off the “sponge” in order to soak up most fluids? Your thoughts again? Eitherway, gonna browse your site a bit more since this was the first page I stumbled upon, thanks again and sorry for any speling mistaykes! Laying down horizontally is going to be much more comfortable and sustainable. Being upside down tends to not feel great on the head :). I only did a quick search for the posture pump as I hadn’t heard of it before. Looks like you’re supine when using it, which is going to hydrate the discs per this post. From what I briefly saw, I’m not sure that machine is doing anything from a hydration standpoint, beyond getting the person to be horizontal. I am getting into the habit of doing headstands for several minutes at a time. Do you think this might help my spinal arthritis at all? That would be compressing the spine. Instead of the feet on the ground, the head is. A *hand*stand could decompress the spine, because neither end of the spine is being compressed. However, it’s common to fall into lumbar extension with upside down holds. Not usually something which helps an arthritic back feel better. Thanks for your response. Maybe I will try to get better at hand stands. 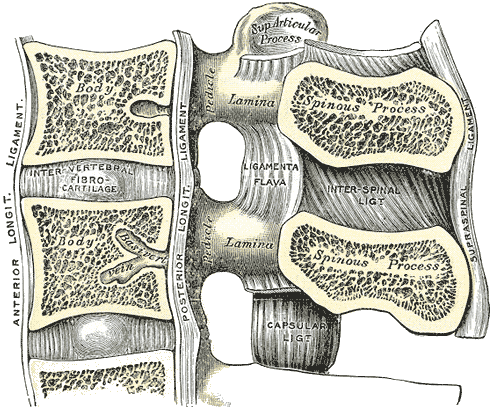 Why is lumbar extension not usually good for arthritis of the spine? Stenosis is increasingly common as people age. If you take a look at the stenosis pictures in the post, you’ll see how into extension there will be less room for the nerves to breathe. Things like nerve compression thus become more likely. 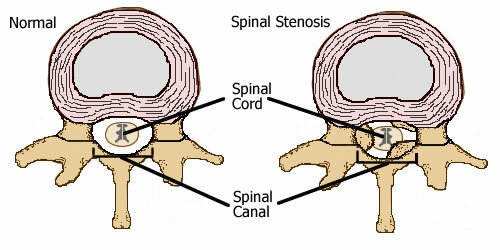 Arthritic spines are often a synonym for stenotic ones. 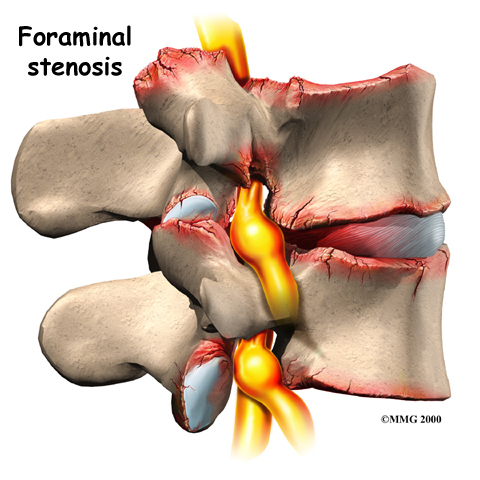 what about Cervical spinal stenosis? what position or exercise is good for that ? Much of the same would apply.